! This is NOT a method of direct communication with CONNIE'S FLOWERS for purposes of ordering or rectifying problems. Connie's went above and beyond to help me get flowers to my mother for my birthday. The arrangement was more than I could imagine. I will be using Connie's for all of my future flower arrangements. Thank you again for your outstanding customer service and attention to detail. Very happy with the arrangement that I ordered. Flowers were beautiful and lasted a long time. 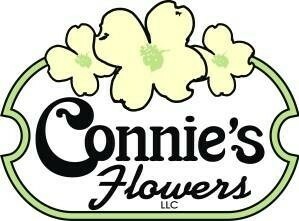 Would recommend Connie's to anyone wanting to order flowers. I asked for a 'designer's choice' live planted basket for my mother's birthday, and the results exceeded expectations! The combination of plants chosen is stunning, they'll all live on for a long time, and they made my mother so happy! Thank you thank you Connie's flowers! Excellent! I ordered flowers from Connie’s to be delivered to my hotel in Helen Georgia, Where my wife and I celebrated our 42nd wedding anniversary. Previously, I had a bad experience with another floral service, So I was somewhat hesitant. However I was not disappointed. The flowers were delivered timely and were waiting in the room as I requested. They were fresh during our stay and remain fresh even though we have been home for a couple of days. I would highly recommend Connie’s as they care about their customers and provide quality product and service. Very NICE arrangement worth the money paid. I ordered flowers for my girlfriend on Valentines Day. I live out of state and ordered over the phone. Both my girlfriend and I were blown away by the quality of flowers and service. I would highly recommend. Quick & easy. Beautiful product well received. The online ordering option made this florist my first choice, and the arrangement was well received. I was able to order flowers for my mother’s birthday in the morning and they were delivered to her the same day. The arrangement was beautiful. We ordered through the website, it was very user friendly. The arrangement was absolutely beautiful, just as pictured and maybe even more so! The delivery was on time. We couldn’t have been any more pleased and will definitely use Connie’s again! Very easy to order online, great pricing and beautiful flowers. I ordered these flowers for my Mom while she was in the hospital. My Mom told me these are the best flowers she has ever received. She loves the arrangement, the quality, the flowers are fresh. She raved and raved about the arrangement. Job well done Connie's! Beautiful arrangements! Flowers are lasting very well. Thank you! Fantastic! They really came thru and the arrangement was truly beautiful. Use them you won't be sorry. The bouquet was beautiful. I was very pleased. The flowers were beautiful and well appreciated by the bereaved. The snack basket was also a big hit! Thanks for your help during such a difficult time. Beautiful arrangement on Mother’s Day. Connie's Flowers was excellent for our daughter's wedding. I highly recommend them for their service and dependability. She went out of her way to make sure we had the perfect flowers. You won't find a better florist in North Georgia! Exceptional service! I highly recommend this florist! Tommy & Anna give their personal attention to every detail! They went above and beyond for my grandson's wedding! Give them a try...I promise you won't be disappointed! Good people! We love your website it makes it very easy to order flowers. Great people to work with. Great value and very conscientious about making certain things at correct. Last week bi ordered flowers from Australia, to be delivered in Cleveland, to a lady turning 97. She was not able to answer door at first so the delivery person returned later. My relativecsaid the flowers were lovely. Ordered a special centerpiece arrangement for my parent's 65th Anniversary on 12/13/17 and it was beautiful! They did a fabulous job arranging exactly what I wanted (at a reasonable price) and my parents loved it! As a matter of fact, other than the roses which lasted almost 2 weeks, the rest of the arrangement is still beautiful, after more than a month! I highly recommend this florist if you're in the area! Passing through heading to The Nutcracker performance for Gainesville School of Ballet and needed flowers fir our granddaughter. They had the perfect ballet slipper vase and Anna made a beautiful arrangement perfect for our 9 year old granddaughter and she loved it. Thanks again!! Although substitution was made, we were extremely happy with service. Great job! Super easy online selection & checkout process, beautiful arrangement! Great and prompt service. Highly recommended. Great service. Very easy to use from overseas and my friend said the flowers were beautiful. Thank you so much to the wonderful staff at Connie's for such great service. Absolutely beautiful arrangement. Big, beautiful, Stargazers. Super friendly service and fast delivery!! Great job! The arrangement sent was even more attractive than the picture. Your delivery service was great and helped make Mom's birthday special. Excellent service and quality product. My mom always enjoys your quick visits and the longer-lasting beautiful arrangements. I called to get a Mother's day order very close to the deadline. They were very kind and accommodating. They had to put a special arrangement together, since the flowers were mostly already taken. They assured me she would love it, and she really did! She said they were absolutely beautiful and was very happy! She also commented on how nice the lady who delivered them was! Thank you for making her day special! The flowers were beautiful! Thank you so much. Awesome service! My wife said they were the prettiest arrangement she has ever seen. Thank you!! Thank you for the upgraded basket. I appreciate your concern for the late delivery. My wife and I were so pleased with our order. 14 days and still blooming. Delivery person was so nice. Thanks much. Can't say enough about how satisfied we were. Thank you kindly for your service. My Grandmother was overwhelmed by the quality of the arrangement delivered. By her description, it was exactly what I ordered. Thank you again for making her Mother's Day special. Best customer service I've had in a very long time! And the flowers were beautiful!!! The Peace Lily was beautiful and the website was easy to navigate. The potted plant is a croton and it's large, lovely to look at and of course my favorite colors. I will give it the best of care and trust it will have a long and productive life. I would definitely recommend your florist to others. You do a GREAT job. The potted plant is a croton and it's large, lovely to look at and of course my favorite colors. I will give it the best of care and trust it will have a long and productive life. Thank you for fast service and delivery. Yes, I will order again from Connie"s.
Gorgeous flowers and great service. Thank you! I am very pleased with Connie's! My Mom loves her flowers and balloons! I will use them everytime! The flowers were absolutely gorgeous! The arrangement was amazing! But that is only the tip of what made this delivery the best! After my mother in law received "bulbs" literally ( that was not the arrangement pictured) from pro flowers on that Friday which I had ordered several weeks in advance for her table centerpiece, I had to find something quickly! I ordered a custom arrangement with no specific dire tons after closing hours. Not only were they gorgeous, but my mother in law spoke so highly of the gentleman that delivered the flowers. She was thrilled! I was excited to see that y'all had gift baskets on your site. I ordered one for my sister's 50th birthday and it was delivers shortly after I ordered it on line. Thank you!! I was very impressed with the splendid artistic touch of the arrangement, quality of the flowers, and overall service fulfilled with alacrity. My daughter's first birthday away from home was made better by your delivery...she loved it!! It was delivered ahead of schedule and was exactly what I had wanted....thank you so much! Flowers were beautiful and delivered on time with no problems. Delivery was perfect! She loved the man that delivered them to her. Recipient was more than excited for the beautiful flowers. Thank you so much! My Moms homecoming from the hospital was made a bit sweeter by the flowers waiting for her on her table. The family was touched by the flowers and after the funeral put the flower wreath on their home front door so all the guest could enjoy. Mr. and Mrs. Peace were so pleased with the flowers. She wrote that they were the only ones they received for their 68th wedding anniversary, and that they were the "icing on the cake"! Thank you for making them happy. The arrangement was beautiful and it made my wife's day! This is an awesome shop.They can do anything.Great for weddings. The owner Anna offers an upgrade on flower vases for additional cost which is great if you do not want an ordinary vase.